You like reading J2 fanfics but you sometimes find yourself swamped with so many stories at once? And then you don’t know which one to read? Well then, we have the solution to your problem: j2_rec is, as the name already implies, a J2 fanfic recommendation community. 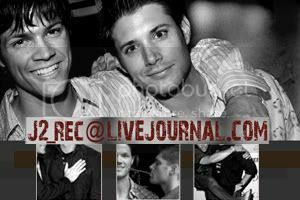 You not only get weekly updates with the latest and best J2 stories, you’ll also find special themed fanfic entries and much, much more. Heheh you guys soo ROCK!!! This is made of AWESOME!!!! I'll pimp it once I'm finished writing! P.S. I just went over 20,000 words!!! And omg... I am SO excited!!! This is awesome news, baby!!! *go Amy... go Amy...* Woot!